Nefesh B'Nefesh is at it again! Birthright (Taglit) is supposed to create a connection for unconnected Jews to Israel and the Jewish people. Statistics seem to indicate it's working (duh, of course its working, who can visit Israel and not be affected or feel connected). So once birthright has primed the pump, NBN jumps in and helps the connected stay connected - or at least that's how it looks to me. They've also extended it to Masa alumni. 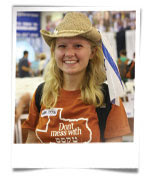 Masa is a Jewish Agency program that acts as the umbrella for people visiting Israel for the year to study, volunteer, or work (this also includes most of the major Yeshiva programs). And what is NBN doing? They're giving money away. Lots of it. Besides the normal financial assistance packages NBN offer Olim. Nefesh B'Nefesh is offering "Enhanced Grants" to birthright and Masa alumni (that means even more money). So if you are a birthright or Masa alumni and considering making Aliyah, then you should contact Nefesh B'Nefesh because these Enhanced Grants won't be around forever. 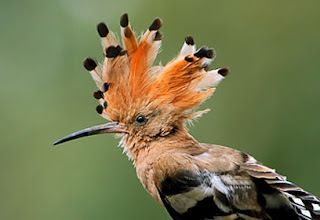 Over 155,000 thousand Israelies voted to chose Israel's national bird, which was announced yesterday. Ehud Barak has got stupendously mind-blowing chutzpa to presume to castigate Ehud Olmert from the moral high ground. Apparently, this entire country has completely forgotten the 2000 State Comptroller's Report, which laid out in excruciating detail the scandal of Barak's network of phony amutot (NPO's) – many of which purported to be charities – through which he illegally funneled millions of dollars into his own election campaigns. Barak did the exact same things that Olmert did. Barak even had his own personal Morris Talansky – an English millionaire by the name of Octav Botner. Barak's strategic advisor at the time – Tal Zilberstein – masterminded and oversaw the entire money laundering scheme, and became one of the prime suspects named in the criminal investigation opened against Barak. Zilberstein is a man who certainly gets around: Today, he is Olmert's strategic advisor. None of Barak’s sordid history, of course, has deterred him from pontificating against Olmert today, demanding that Olmert resign or suspend himself. Nor do the media seem to have noticed the incredible irony and hypocrisy in Barak assuming the mantle of Mr. Clean with regard to a matter involving illegal cash transfers and money laundering. What a surprise. The most prolific Orthodox Jewish blog on economic issues in the JBlogosphere is by far Orthonomics. Understandably, the majority of the issues she raises relate to economics in the United States -- so a service to all, I present a special Muqatonomics (tm) edition on the economics of living in Israel. As my father-in-law loves to remind me, Israel is a rich country. Well, not exactly -- there's Jewish education which is still much more inexpensive here in Israel, but many more staples are more expensive. 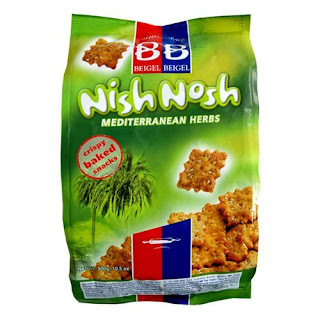 What I'd like to understand is why an Israeli snack food, "Nish Nash", (known in Israel as "Nishnushim") is manufactured in Israel, sold in stores in Israel, yet costs 3 times more in Israel than via Amazon in the United States?! In the USA -- on Amazon, you can buy 2 twelve-packs of the same product for $32.46 (using the $10 bonus coupon offer "BEIGEL05") and you are entitled to free shipping! $32.46 for 24 packs comes out to $1.35 (or 4.49 NIS at today's 3.32 exchange rate). Why does it cost 3 times more in Israel? Simple. We're a rich country. ...and I doubt it will be aired in the USA either. And that's unfortunate. Last night during dinner I told my 12 year old daughter that it was Memorial Day weekend in the United States, and that Monday (today) was memorial day. She asked what "memorial day" meant, and I said, it's "Yom HaZikaron" for the Americans, remembering those who fought, were wounded, and died in America's wars. She asked what they do in America to commemorate it -- here in Israel, it's an extremely solemn day, with a nighttime and morning one minute long siren blast across the country, public eateries are closed, movie theaters are closed, all radio channels have reserved music, and most of the country is united in pain, remembrance and comforting the families of those who fought for Israel. It was difficult, almost embarrassing to tell my daughter that for the majority of Americans, Memorial Day is mostly about shopping sales and a long vacation weekend. While there are some memorial ceremonies, the vast majority of Americans do not attend them. The least I could do this Memorial Day, as an Israeli-American living in Israel, was to spend a few minutes writing about the sacrifice of America's soldiers and veterans -- and their families. So how would I Google search for a picture? The obvious choice for me would be Arlington Memorial Cemetery. 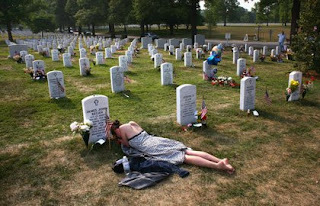 I was looking for of a photo of the solemn, seemingly endless rows of simple tombstones of America's soldiers. 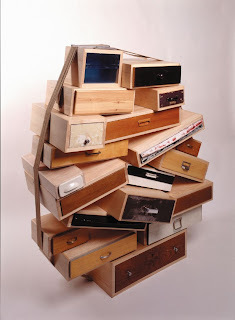 Yet while searching for the perfect blog picture, the photo (pictured above) hit me first. Taken last year at Arlington, Mary McHugh lies before the tombstone of her fiance. I don't think she's running out to a sale or barbecue. Section 60 is not about a troop surge or a war spending bill or whether we should be fighting these wars at all. It is about ordinary people trying to get through something so hard that most of us can’t ever imagine it. Everyone I met that afternoon had a gut-wrenching story to tell. Mary McHugh is one of those people. She sat in front of the grave of her fiance James “Jimmy” Regan, talking to the stone. She spoke in broken sentences between sobs, gesturing with her hands, sometimes pausing as if she was trying to explain, with so much left needed to say. Later on, after she spoke with a fellow mourner from a neighboring grave, I went over and introduced myself and told her I was photographing for Getty Images and had brought my family on our own pilgrimage to the site. I told her we had been living in Pakistan for the last few years, how we had come back to the States for a few months for the birth of our second child. Mary told me about her slain fiance Jimmy Regan. Clearly, she had not only loved him but truly admired him. When he graduated from Duke, he decided to enlist in the Army to serve his country. He chose not to be an officer, though he could have been, because he didn’t want to risk a desk job. Instead, he became an Army Ranger and was sent twice to Aghanistan and Iraq - an incredible four deployments in just three years. He was killed in Iraq this February by a roadside bomb. After a few moments more, my beautiful wife, Gretchen, now almost 9 months pregnant, walked over with our two-year-old Isabella. Our daughter started climbing over me, saying “daddy” in my ear and pulling on my arm to come walk with her. I felt awkward and guilty about the contrast, but if Mary felt it too, she was nothing but gracious and friendly. I told her that I would forward her some photos of her from that day if she would like and she gave me her email address. We said our goodbyes and I moved on with my family through the sea of graves. Later on, I passed by and she was lying in the grass sobbing, speaking softly to the stone, this time her face close to the cold marble, as if whispering into Jimmy’s ear. Some people feel the photo I took at the moment was too intimate, too personal. Like many who have seen the picture, I felt overwhelmed by her grief, and moved by the love she felt for her fallen sweetheart. After so much time covering these wars, I have some difficult memories and have seen some of the worst a person can see - so much hatred and rage, so much despair and sadness. All that destruction, so much killing. And now, one beautiful and terribly sad spring afternoon amongst the rows and rows of marble stones - a young woman’s lost love. Perhaps America needs a national moment of silence and a wailing siren similar to Israel. If you don't appreciate the sacrifice of your country's sons and daughters, do you really deserve the shopping sale? In the space of a few minutes, I heard of two separate (religious) individuals (one type O in Israel, one type A in the US) in their 20s looking to donate one of their kidneys to complete strangers. I've never heard of this before, so upon hearing this, and learning that (at least) one of the individuals learns in a B”T yeshiva, two thoughts immediately came to mind, either this is a disturbing new cult trend, or the guy is trying to get over some major psychological guilt feelings he has from his past and figures this will help. I admit it could be they are truly altruistic, and they see this as a natural and obvious outlet for their altruism, but that simply wasn’t among the first thought that crossed my mind. It all sounded so strange, I started to do a little research. It turns out that there is actually a Kidney Macher in the Jewish Community. A young woman name Chaya Lipschutz, who she herself donated a kidney to a complete stranger, and now is working hard to get other people to donate kidneys too. And there is a non-profit Jewish organization that is also involved in this called Renewal. However, I am still personally having trouble contemplating the concept that someone might willingly and voluntarily give up a non-renewable piece of his or her body to a complete stranger. I’m sorry if you all now think less of me, but I simply can’t get my mind around it, even if it is clear that they are saving the life of someone with their actions. I’m also aware that some readers here will take exception to what I am writing after either donating or receiving a kidney themselves (or knowing someone that did), or because they see only the positive side to the story. I will whole-heartedly agree that it is clearly an incredible mitzvah to perform, and you are clearly changing and saving the life of the recipient. So let’s hear what you have to say, because my first reaction when hearing these stories was that something is wrong with these people, while the initial reaction of the person who told me the stories was only the highest of praise. If you want to read about this (the subject, not the specific people that I heard about) in more detail go to the article on the Aish site. This newly released video from Hamas provides a rare (probably first time) glimpse into the way the Hamas Secret Service protects (or doesn't) Gaza Prime Minister Isma'eel Haniyeh. In a last ditch attempt to save his skin from prosecution, Israel's Prime Minister Ehud Olmert played his trump card only minutes ago. The Prime Minister's Office announced Wednesday that Israel and Syria have launched direct negotiations in Turkey. Ynet has learned that Prime Minister Ehud Olmert's associates, Yoram Turbowitz and Shalom Turgeman, have been meeting with senior Syrian officials in Ankara since Monday. Despite the spam mail circulating on the internet, in which Olmert requests your assistance to help retain his fortune, his latest tactic of using a "peace" deal with Syria is bound to make the peace-hungry Israeli establishment quickly forget about any wrongdoings Olmert may have committed. 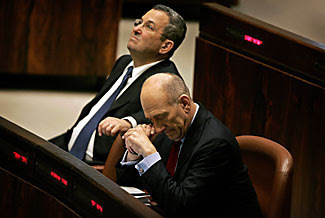 5 hours ago, political eulogies were written for Olmert. Now he's eying Noble Peace Prizes. Makor Rishon reports that Defense Minister Ehud Barak has approved the opening of 2 "Palestinian National Security Forces" Police Stations in Gush Etzion, one in Sa'ir and one in the Arab village of Tekoa . Each station will have 10 "policemen" -- 5 armed with semi-automatic handguns, and 5 armed with fully automatic AK-47 Kalashnikov assault rifles. "The opening of the Palestinian Police Station in Sair and in Arab Tekoa are approved within the framework of opening 20 Palestinian Police Stations in the Central Region. Their activies will be under the supervision of the IDF. The Tekoa station is not located on the Gush Etzion/Dead Sea road because the station is inside the village -- the policemen inside are only permitted to uphold public order within the village. The weapons are only for self defense from Palestinian law-breakers and for the policemen to carry out their duties"
At this point, I would like to remind the Jewish residents of Gush Etzion, that many of the recent terror activities in the West Bank were carried out by these Palestinian Authority "policemen" (and officers) who were under the supervision of the IDF, and who were only supposed to use their weapons in "self-defense." The murder of Ido Zolden -- a resident of the settlement of Shavei Shomron, who was driving on road 55 toward the settlement of Kedumim in the northern West Bank on November 19, 2007 when terrorists in a passing vehicle opened fire, critically wounding him. Haaretz reminds us that "according to information released for publication Sunday night, the attack was carried out by three Palestinians, members of Palestinian National Security force. 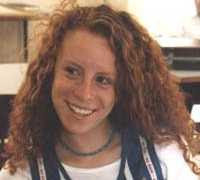 Not far from Gush Etzion, Ahikam Amihai and David Rubin were killed in a terror attack on Friday, December 28, 2007 when they were hiking near Hebron. Again, Haaretz informs us that The terrorists who carried out Friday's shooting attack near the West Bank city of Hebron, killing two Israelis, were both employed by the Palestinian Authority, according to information made public yesterday. They were all members of the Palestinian national security forces. You can see in the picture above what the "policemen" look like -- they carry AK47's and are all members of the Palestinian Authority "national security forces". Time to start wearing shachpatzim (bullet proof vests) again. The Closing of Volozhin; Jewish Urban Legend? It's impossible to traverse Chareidi circles without hearing that the famous Volozhin Yeshiva was closed by its Rosh Yeshiva, the "Netziv" (Naftali Zvi Yehuda Berlin (נפתלי צבי יהודה ברלין) -- because he would rather close the Yeshiva than for his students go to University and study secular subjects. This mantra is often repeated as a primary reason to avoid Yeshiva University, any combination of Yeshiva and College studies, or secular studies in general. In May 1988, looking for a donation, the Lakewood Cheder School sent me a copy of the book, "My Uncle the Netziv" -- written by R' Baruch HaLevi Epstein (author of the Torah Temima) and nephew of the Netziv. The book was adapted into English by R' Moshe Dombey and under the general editorship of Artscroll Mesorah Rabbis and Publishers Nosson Sherman and Meir Zlotowitz. The book's jacket states, "This is the sort of book that cannot -- and should not -- be put down." I enjoyed the book at the time, and found the life and times of the Netziv to be an interesting read. A few months later the Lakewood Cheder School sent me a bizarre letter (pictured at left) in which they sincerely apologized for sending me such an offensive book. They insisted the book not be read -- and they even offered to refund any donation I may have sent them. Why was the book recalled and banned? What was so terrible in the book that caused such a radical reaction from Lakewood? The recall letter was rather vague about what was wrong with the book, but as a teenager I realized if they were recalling the book, it was worth keeping. There are a few possibilities for the ban, but in my opinion there are 2 primary reasons. 2. Women and Learning. (I wont address this point in this post). So what did college have to do with the closing of the Yeshiva? Assuming we accept the premise that the yeshiva was indeed closed over something connected to "secular studies", R' Epstein explains what was actually proposed, which caused his uncle to close the yeshiva. 1. The general studies program shall take place between nine o'clock in the morning and three in the afternoon. 2. There shall be no [yeshiva] studies at night at which time the yeshiva building shall be closed. 3. The entire study program shall be no longer than ten hours per twenty four hour period. 4. 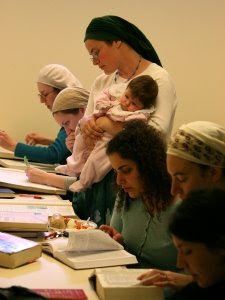 The Rosh yeshiva and all the instructors shall possess an educational degree. The result of all this was that during the winter months no time at all would remain for studying the Talmud. Even in the summer, considering that the general studies program would finish at three in the afternoon followed by lunch, only minimal time would remain for Torah study. The students would also be exhausted from 5 or 6 hours of general studies, and thus the best hours of the day would have been wasted. The point of the maskilim, who pressed the issue in the first place to the Russian government, was to close the yeshiva -- and in the week of Parashat Bo, 1892, the yeshiva was closed. R' Epstein's version of the story leaves little room for misinterpretation. 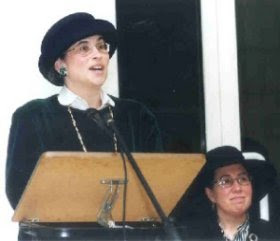 The Netziv was not anti-secular studies, the students of Volozhin studied (at least) mathematics and Russian within the scope of the Volozhin curriculum, and the closing of the yeshiva was due to the outrageous order reducing yeshiva studies to a bare minimum (or none), with secular studies taking up the vast majority of the students' time. My Uncle the Netziv, Chapter 13, "An Act of Satan", pages 206-209. Professor Shaul Stampfer of the Hebrew University of Jerusalem discusses "The Closing of the Yeshiva of Volozhin" [Hebrew], in his Hebrew-University-dissertation-turned-volume, Ha-Yeshivah ha-Lita'it be-Hithavutah (Jerusalem: Merkaz Zalman Shazar, 1st ed., 1995; 2nd ed., 2005), 208-250, with an appendix to chapter eight published in the updated (2005) edition on pages 251-266, including a half-dozen never-before-published correspondences from newly available sources from Russian government archives (and he reprints a [Russian] document on page 253), in Hebrew translation, pointing that the closure was related to "in-fighting" (my wording) amongst the administration of Yeshivat Etz Hayyim, rather than simply a disagreement over the government inclusion of secular studies into the institutional curriculum. Time: Yesterday (Monday) evening, 6:50 PM. Situation: Routine checks on Palestinian population for weapons. The following is based on a radio interview this morning on IDF radio (Galei Tzahal) between the checkpoint commander and Radio interviewer, Razi Barkai. The checkpoint commander is a 22 year old officer from the Nachal Brigade -- his unit took over the checkpoint for the first time yesterday. Corporal Michal Ya'akov, from the IDF military police is also assigned to the checkpoint. The checkpoint commander said the following incident lasted 8 seconds. A "16 year old" (that's about how old he looked) Palestinian approaches the IDF checkpoint. Michal notices "he seems very nervous...was looking from side to side....his shirt looked bulky." He goes through the metal detector and it beeps. Michal asks what is under his shirt. He raises his shirt, displaying 3 pipe bombs strapped to it. Michal yells out, "Explosives in the Checkpoint", and all soldiers immediately follow the protocol for a terrorist at the checkpoint. The checkpoint commander, about 10 feet away, instinctively chambers a round into his M16 and aims it at the youth's head. Michal yells at the Palestinian youth to keep his hands high over his head. He lowers his hands towards the pipe bombs strapped to his chest. The checkpoint commander fires, shooting the terrorist directly in the head. The terrorist starts to fall to the ground, with his hands still reaching for the pipe bomb. Checkpoint commander fires another 3 rounds into the terrorist's head -- taking special care not to shoot at the body of the terrorist, but only the head, to prevent the pipe bombs from exploding. Final Result; One Dead Terrorist. No injuries to IDF soldiers. No terror attack against Israelis. Eight Seconds; it could have ended very differently. For an article with slightly less accuracy than the above post (based directly on the radio interview with the checkpoint commander), here's the way YNET reported it. Mazal Tov to Commenter Abbi on the birth of a baby boy this past Friday night. She's not just a commenter all over the JBlogosphere, but we're honored she guest blogs here at the Muqata as well! A friend of mine son's was hit by a car a few weeks back, breaking his jaw and his leg in the process. Yet every time I see this friend, she has a huge smile on her face and tells me how God is in the details of everything and how fortunate they are that their son's injuries were so minor. "He only broke his leg and his jaw...and his jaw is wired shut, but it's all for the best." She thanks me when I put up posts on my blog that could strengthen one's faith, and tell me to ignore cynical commenters. I saw her the other day, and again with this huge smile on her face she tells me, "You can't imagine what a miracle it was that my son was hit by a car and broke his jaw..."
I smile back and say, "I'm glad he's getting better." But then she adds, "No, you don't understand, if he HADN'T been hit by the car, and broken his jaw, he wouldn't have had a CAT scan, and then we wouldn't have found out about the tumor in his head! 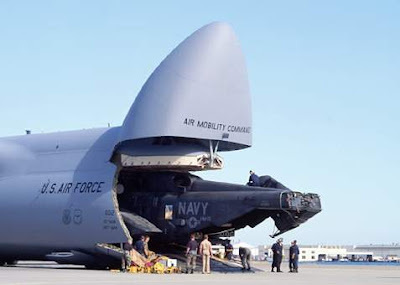 Thank G-d it's operable, but can you imagine if we didn't find it now...?" You can say Tehillim or send positive thoughts for Chayim Zvi ben Henya Devorah. The Lost Sandal - 1000 days have passed. days before it was bulldozed in 2005. 40.2 percent of the Gaza evacuees are still waiting for lots on which to build their new homes. 43% - 586 families - have received housing lots and can now [May 2008] start construction. Ex-Prime Minister Ariel Sharon and the Israeli government promised that the resettlement process would take up to two years, and promised on the SELA eviction website [though not anymore] and in paid advertisements that there was a "solution for each settler." The blatant callousness of the Israeli government and of Disengagement supporters who do not spend every second of their days trying to help the solve the refugee problem they created is simply mind-numbing. One thousand days have passed. Helping children cope is a new book, "Eyal's Sandal," written by Ruth Etzion, previously from the Katif community of Morag and illustrated by Sarit Stern. A young boy, Eyal loses a sandal when playing on the sand dunes near his home in Gush Katif. His faithful sandals always waited as a pair for him while he played in the sand dunes, so it can't be far. However, the Disengagement dashes his hopes to find his lost sandal, as he and his family are removed from Gush Katif and his sandal. 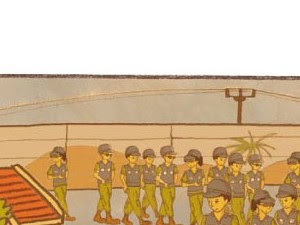 The book poignantly describes the difficulties in living in Gush Katif prior to the Disengagement, the trials of a child trying to come to grips with a difficult future, "Abba, are the same soldiers who I love so much going to be the ones throwing us out of our home?" Despite it all, the book ends optimistically. Even if your family didn't go through the Disengagement, this book is a must for every Jewish family to understand what their fellows Jews went through, and are going through today. עַל תָּכְניִּוֹת לַהֲרֹס אֶת הַגּוּשׁ, וּלְפָרֵק אֶת כָּל הַיִּשּׁוּבִים. I started to hear all sorts of bad things, programs to destroy Gush Katif, and dismantle all the towns. לַאֲמִירַת תְּהִלִּים וְלִתְפִלָּה (גַּם קִבַּלְנוּ מַמְתָּק קָטָן). שֶׁנַּמְשִׁיךְ בּוֹ תָּמִיד לִחְיוֹת, שֶׁלֹּא יִהְיֶה גֵּרוּשׁ. אֲבָל אֲנַחְנוּ, הַיְּלָדִים, הִמְשַׁכְנוּ כָּרָגִיל בְּכָל הַמִּשְׂחָקִים. מֵאֲחוֹרֵי הַקָּרָאוָן שֶׁל הַתַּאיְלַנְדִּים שֶׁעוֹבְדִים עִם אַבָּא שֶׁל אוֹרִי. It was then we discovered the giant sand dune next to the back gate, behind the Thai worker's caravan which worked with Ori's father. וּכְשֶׁסִּיַּמְנוּ לְשַׂחֵק, חִכּוּ לִי בַּצָּד, בְּנֶאֱמָנוּת, זוּג הַסַּנְדָּלִים הַשְּׁחוֹרִים. And when we would finish playing, always waiting faithfully for me, was my pair of black sandals. This posting is not a paid advertisement. Published by Beit-El for 39 NIS. I write these last words in the hope that you will always remain together. I request from my wife that you forgive me, take care of yourself, and provide a good education for our children. The day will come when my children will be proud of me, and you dear Nadia, you are permitted to remarry another man to be a good father for our children. In this matter, you are completely free [to marry whoever you wish]. I beg you not to mourn what has happened but to look towards the future. I send you my last kisses. Please pray for my soul. "One of the most memorable and daring attempts to infiltrate Syria, which at the time controlled the Golan Heights and frequently shelled the Israeli settlers down below is that of Eliahu ben Shaoul Cohen an Egyptian born Jew. 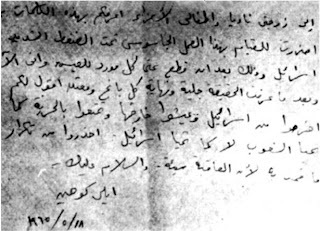 Eliahu ben Shaoul Cohen, worked as a Mossad agent in Damascus, Syria under the alias of Kamal Amin Ta'abet from 1962 until his exposure and execution on May 18, 1965. Cohen was able to supply considerable details on Syrian political and military matters because of his strong interpersonal skills and abilities to build close ties with business, military, and Ba'ath Party leaders, and Syrian President Amin el Hafiz. He was hanged in Martyr's Square with the television cameras rolling for the entire world to see. Eli's influence on Syrian officials helped Israel beyond measure. Eli suggested that the Syrians plant trees on the Golan near each of their fortifications. Based on the eucalyptus trees, Israel knew exactly where the Syrian fortifications were. Two years after his death, in June 1967, the intelligence Eli Cohen provided enabled Israel to capture the Golan Heights in two days as part of Israel's victory in the Six Days War. Eli Cohen was the greatest Mossad agent Israel has ever known. He was greatly admired by all, including the Syrians. His deeds fed and are still feeding the imagination and fantasy of many. He is a hero who sacrificed his life for the sake of Israel, his fellow Jews, his children and his family. This movie trailer is based on Eli Cohen's life and death, "The Impossible Spy"
Hashem Yikom Damo, May G-d Avenge his Death. Last night was the final episode of the Israeli "pseudo reality" TV show, "Hisardut" (Survivor -- apparently based on a US show I've never seen), and was the buzz of radio talk shows this morning. The show doesn't deserve to be written about, I will just make 2 points. I can understand men or women who have to leave home for business trips, but to participate in a reality TV show leaving a baby at home and a dying father? What sort of woman throws away the last few months of her father's life or the importance of being with her child, to participate on a TV show for a chance to win a jeep and a few thousand dollars? The judges (the losing contestants) voted her as the best survivor, throwing out a nasty lawyer "Dan" who lied to everyone left and right to get to the end. It's not surprising that he is already talking about going into politics in Israel. Who is in the Knesset today? Liers, theives and political prostitutes, many who abandoned their party platform of the Likud to carry out the Disengagement -- throwing close to ten thousand Jews out of their homes. Their reality continues every day, with unemployment at over 50%, and more than 90% without permanent housing solutions. They were democratically thrown off the island into shark infested waters that continue to harass them daily. While the finalists of Israeli Survivor many not be Kadima's politicians of tomorrow, Shimon Peres and Ehud Olmert's government need to stop treating the State of Israel as a reality show. I guess we've survived worse. We've seen the Burka women in Ramat Beit Shemesh, we've heard about Eliyahu Chen, and now..."Megirot." Kudos to MominIsrael for translating this story on Erev Shabbat and posting it. I never would have found the time. YNET and others have said this for a while (over 2 years ago), but I guess Makor Rishon got around to it now. Next on the cult list: Agel and the Fly-Lady. Question: President Bush is currently visiting Israel, snarling up traffic in all directions. He came with an entourage of dozens of cars, trucks, jeeps, and 6 helicopters. How did all this stuff get here? 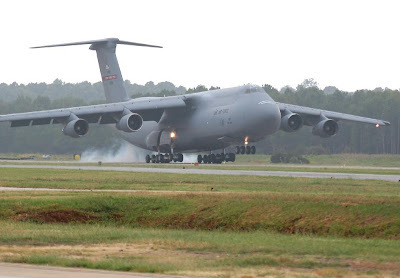 Answer: Galaxy C-5 transport planes landed at Ben-Gurion airport last week. 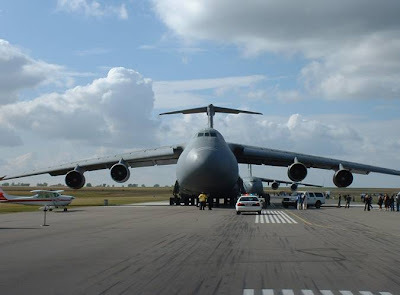 Here's are some pictures of what this massive plane looks like. Question: Where was yesterday's rocket attack in Ashkelon launched from? Answer: The remains of Dugit -- A settlement destroyed and evacuated during the Disengagement, 8.08 miles (as the missile flies) from the Shopping Mall in Ashkelon. In light of yesterday's rocket attack, where over a hundred people were wounded at an Ashkelon Shopping Mall, should yesterday's gala dinner and celebration in Jerusalem hosted by Shimon Peres as part of the Israel's 60th birthday "President's Conference" have continued as planned? Should Israel's leadership have gone to Ashkelon to comfort its residents or convened an emergency session with the IDF on how to provide minimal security for Israel? Or should they have continued, "business as usual" with the dinner, heaping lavish superlatives on George Bush and the United States insisting "the party must go on?" Driving home, I listed to Shimon Peres' speech last night at the dinner party over the radio. Despite his initial mention of the terror attack, his speech was rosy and euphoric. Not mentioning Israel's missing soldiers in Gaza and Lebanon, Peres glowed as he addressed world leaders. VIPs and wealthy businessmen. The crowd cheered and clapped with his every mention of Sederot, the IDF, and America's friendship, specifically that of George Bush. There was only one statement that left the crowd strangely silent, "We have not lost our will for peace." No one clapped, no one cheered. The more the daily reality of Palestinian terror and violence contrasts with Shimon Peres' view of Middle East peace, the more his resolve and ideology is strengthened. It's almost Messianic. Sedeort? Ashkelon? Suicide Bombers? Gaza? Forget yesterday. Ignore today. Let's look for tomorrow. Dreams can be achieved through pragmatism yet the Peres dream for peace is based on fantasy. While Peres and Olmert continue to party, the rest of us are mourning the dead and praying for a full recovery for our wounded. 24 year old Adi Afgin, has requested that people pray for the recovery of his wife and 2 year old daughter who were both seriously wounded in yesterday's rocket attack in Ashkelon. 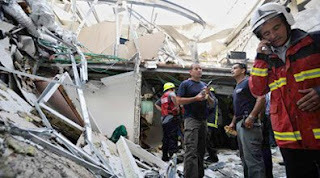 His 2 year old daughter's name is "Ta'eer bat Avital" and his wife's name is "Avital bat Penina"
Mass Casualty Event: Rocket hits Ashkelon Shopping Center! 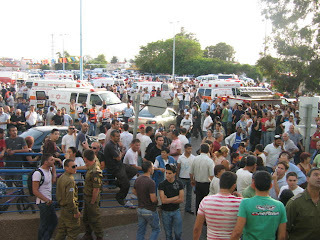 5:58 PM - Magen David Adom declares emergency mass casualty event -- direct rocket attack hit on Ashkelon Shopping Mall! 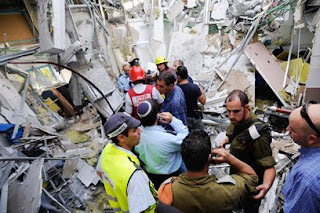 6:04 PM - Rocket (Grad/Katyusha) hits Kupat Cholim building within Ashkleon. Many wounded reported, unsure if they are victims of fright or wounded by shrapnel/explosion. 6:07 PM - Many trapped in rubble of the building. No estimates yet of # wounded. 6:08 PM - Wounded being evacuated to Ashkelon's Barzilai hospital by ambulances. 6:10 PM - No warning siren sounded prior to the rocket strike. Channel 10 reports dozens of wounded. Most of them are probably from fright. 6:17 PM - Five wounded taken to hospital already. 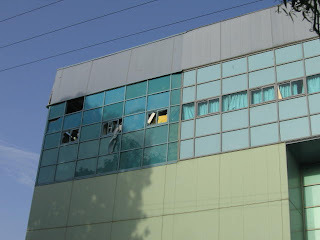 Missile strikes Kupat Cholim (medical clinic) located in the Ashkelon Shopping Mall. 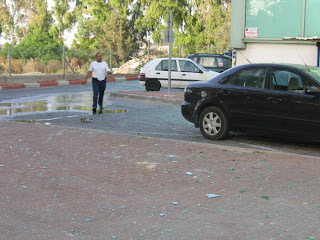 6:23 PM - Another rocket landed in the shuk area of Ashkelon. 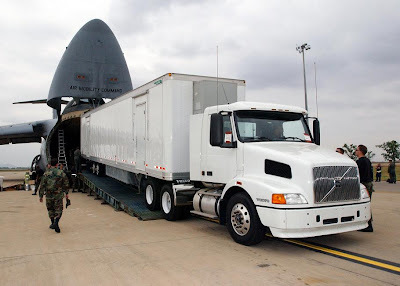 Channel Two reports the Palestinian rocket launches came from the destroyed settlement of "Dugit" in the Gaza Strip which were evacuated as part of the Disengagement. 6:24 PM - As of now, 8 wounded: 2 seriously, 2 moderately, 4 lightly. 6:26 PM - 10 wounded: 3 seriously, 2 moderately, 5 lightly. 6:35 PM - Warnings of Additional Rocket Launches towards Ashkelon - emergency personnel running to shelters. 6:46 PM - More wounded found on 3rd floor of shopping mall. 30 wounded treated so far. 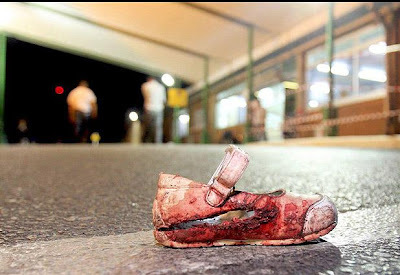 6:50 PM - Channel 10 reports the Grad rocket that hit the shopping mall was smuggled into Gaza from Egypt and is manufactured in Iran. 6:56 Pictures from rotter.net of rocket attack on shopping mall. 6:58 PM - Reports that one of seriously wounded is a 2 year old baby girl -- both legs were severely wounded in the attack. 7:03 PM - Magen David Adom, IDF and Police raise Gaza surrounding community status to 3 (highest warning/preparedness level). IDF investigating why "Color Red" Emergency Broadcast system not activated. 7:09 PM - Shas MK Eli Yishai cancels dinner plans with George Bush and Ehud Olmert -- he is now on route to Ashkelon to meet the wounded. 7:12 PM - Additional warning from IDF of possible incoming rocket attack on Ashkleon. What better welcome could George Bush expect? Perhaps he and Olmert should visit the wounded in Ashkelon now as well? Cowards. 12:35 PM - Final Roll Call: 105 wounded, 4 seriously, 10 still hospitalized. Medical clinic inside the shopping mall totally destroyed. For all those that want to know how Jameel knows about the cool events that no one else know about. You hereby are all notified in advance of this cool event. Asia Times Ranks Israel as the Happiest Country! What the heck is going on in Lebanon? !